Even though many Americans would deny it, class distinction continues to define us. It is the underlying theme in much of our drama (certainly it is a running theme in many of the shows I work on, including THE O.C. and GOSSIP GIRL). And it is the framework that shapes the debate of much of our national politics (I continue to be amazed that so many of the lower and middle-class continue to vote against their own economic interests). We like to think that we’re an egalitarian people; that we believe in democracy and fairness; that everyone has equal opportunity; that all are entitled to and able to achieve the same things. But I don’t believe it. There is a divide between the rich and the poor—and it is difficult to cross. We live in a plutocracy–the haves will always have it easier and will continue to exploit the have-nots to their own advantage, and few will lose sleep over those they pass on the way up the ladder. Capitalism is worshipped as a religion and the bottom line rules. Circumstances dictate behavior, status and power are goals that are celebrated, and people often succumb to their worst impulses in order to be perceived as winners. 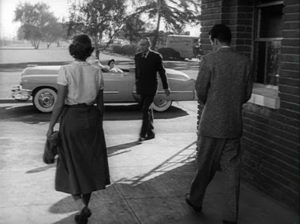 George Stevens’ A PLACE IN THE SUN tackles these issues and the film continues to resonate for me, 60-some-odd years after it was filmed. It’s one of my favorite films and I never tire of watching it, because it makes me understand these ideas on a visceral level. It feels as topical today as it did when it was released. Stevens captures the moral and psychological ambiguities that define ambition, and the pain of longing for that which is beyond our grasp. 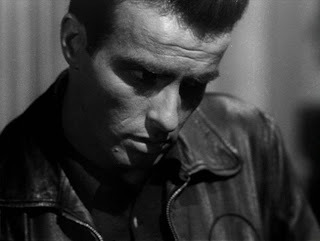 Based on Theodore Dreiser’s naturalistic novel An American Tragedy, the film visually examines the thought processes that drive a young man to contemplate murder, and it actually makes us sympathize with him, to understand the shadow impulses that sometimes overwhelm an individual. How it manages to do that is a lesson in how to compose a powerfully effective shot. 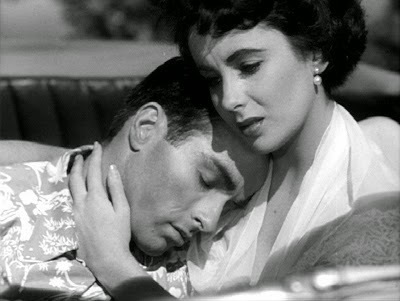 The title of the film evokes the myth of Icarus, and the danger of flying too close to the sun. Its visual template relies upon the contrast between light and dark; between fluid tracking shots and locked-off tableaus that indicate stasis. 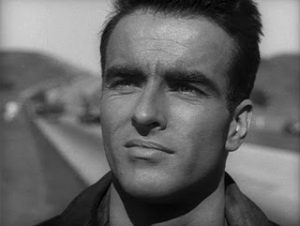 The opening shot introduces George Eastman (played by Montgomery Clift). He is presented in bright sunlight and his face looks initially heroic and hopeful. 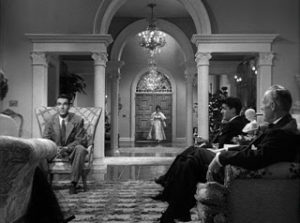 Fleeing his lower-class roots, and his upbringing by a mother mired in religious fanaticism, the story follows George as he gets a job in his wealthy uncle’s factory. 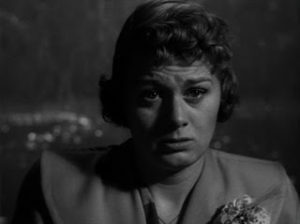 Against the warning of his uncle, he becomes involved with a factory girl, Alice Tripp (played by Shelley Winters), and ends up impregnating her. 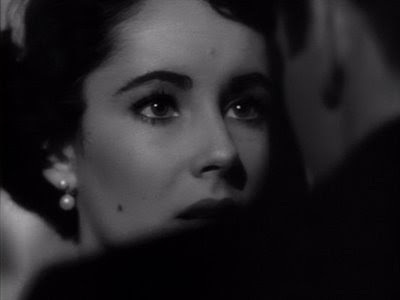 When he falls in love with another girl, the wealthy Angela Vickers (played by Elizabeth Taylor at her most beautiful), he begins to consider murdering Alice to protect his new relationship and newfound social standing. Reinforcing the themes with much description and multiple points-of-view, Dreiser’s novel dissects the fundamentalism and social forces that run beneath the story of this ill-fated triangle. The book is dense and sometimes pedantic. The film is anything but. 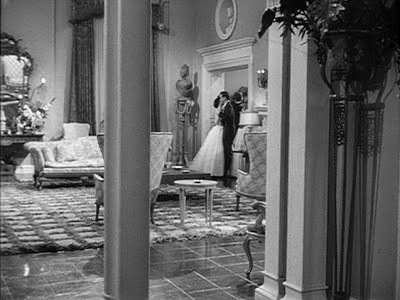 The ideas are presented allusively, suggested rather than stated–through the production design and costumes, the composition and image size, and the way in which the actors move through the frame. It’s social commentary disguised as melodrama, with a metaphoric component that makes almost every shot worth contemplating. What are the forces that drive us, the values that we’re taught to embrace, and in what circumstances might we bend the rules without consequence? Elizabeth Taylor’s entrance into the film, and into the protagonist’s consciousness, is a stunning wide-angle shot that I’ve been looking to rip off for years. 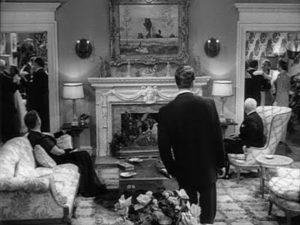 George sits in the foreground, talking to his uncle’s family, as Angela enters in the background. 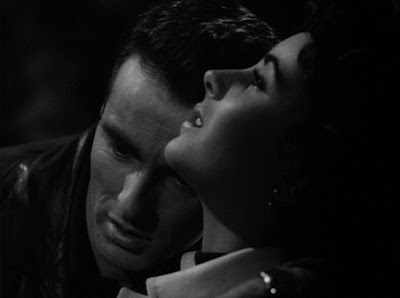 As she moves toward him, we know before he does that she will alter his life, as though his doom is preordained. Her character’s name was changed from Sondra in the novel to Angela in the film, evoking the idea of a heavenly creature, which again suggests the Icarus myth. George’s name was also changed from the novel, from Clyde. George means earth-worker, so the names themselves reflect their inhabiting separate worlds. 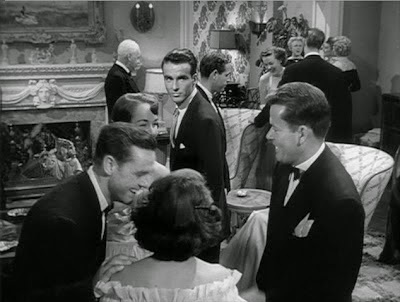 George’s outsider status is reinforced as he enters a party at his uncle’s home. The camera glides behind him as he moves through the room—the house feels huge, and everyone faces away from him. 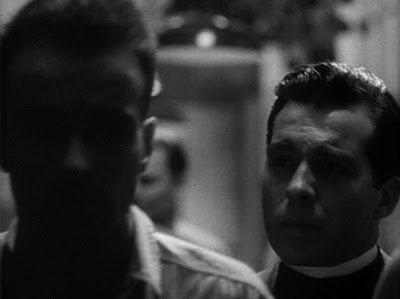 The camera moves alongside him so that we can see his face, looking uncomfortable, wanting to be a part of things but unable to find a way to connect. The other people at the party move away from him, and at the same time the camera retreats in the opposite direction making him smaller in the frame. 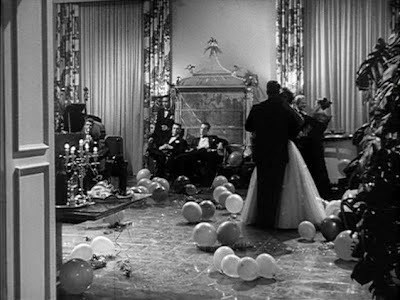 I can think of no other film that so captures the sense of feeling out-of-place at a party. Angela is the one who initiates the relationship with George, approaching him with the confidence that wealth brings. She’s always pulling George through the frame and the large, luxurious spaces–coaxing him, teasing him, tempting him, as the camera elegantly sails around them. She dominates him, even mothers him, and in one extraordinary sequence, pulls him onto the dance floor, as an incredibly long dissolve of his missionary mother is superimposed over their dancing figures. This shot gives way to a gorgeous shot of Taylor, emphasizing the surrendering of the mother’s moral hold over her son to the intoxicating power of Angela’s beauty. It is a perfect metaphor for the weak power of religion in the face of the promise of wealth, beauty, and position. The scene where George and Angela confess their love to one another is one of the most famous scenes in cinema. 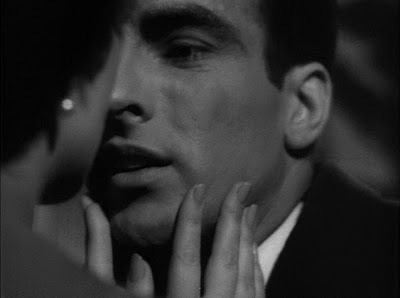 The images are so large and romantic that one cannot help but give into the idea of their love affair as an inevitability, even though it runs counter to our moral sense of what’s appropriate–and thus it stirs our compassion for his moral weakness. In the following shots, George lies with his head in her lap, like a child. 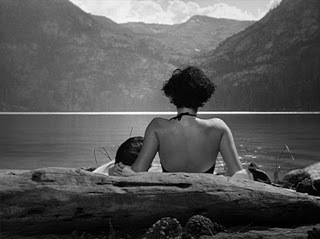 In the second shot, she hovers over him, looking out at the lake where Alice will drown—her physicality again overpowering him and, by implication, his thoughts. In shot after shot, she dominates. She’s always idealized, representing everything that he wants and can’t have, particularly since he knows by this point in the story that Alice is pregnant. By contrast, the character of Alice initially behaves timidly with George—she moves awkwardly and is shy with him, in the same way he is with Angela. Alice is shot in static shots–the camera almost never moves when she’s in a scene–which suggests subliminally that the relationship is stalled, going nowhere. 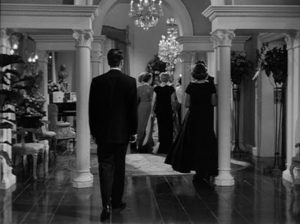 In the shot below, George moves away from Alice to the right, revealing Angela between them, the man crossing the frame bringing our attention to Angela instead. 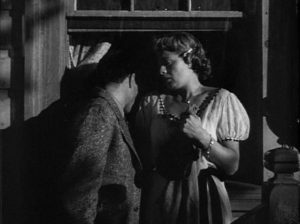 In discussing the Alice Tripp character, Stevens says, “I wanted her to appear to be the kind of girl a man could be all mixed up with in the dark, but come morning wonder how the hell he got into this.” His idea is borne out in the visual design of the film, shooting Shelley Winters in shadows and oftentimes not even seeing her face at very emotional moments. 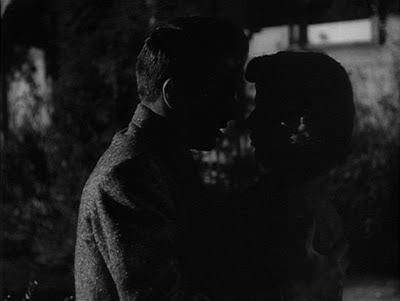 By these cinematic choices, the nature of the relationship is shifted to a instinctual, primitive context. It reinforces the idea of determinism, which was one of Dreiser’s themes in his novel. Alice fades into the dark—exactly where George wants to keep their relationship. 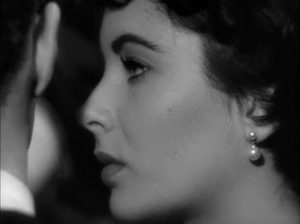 He seduces her without looking at her, and the scenes with her frequently end in blackness. The scene where Alice tells George she’s pregnant is particularly interesting. 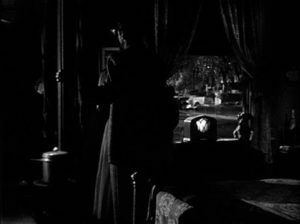 The shot is locked off and Alice sits across from George, with her back to the camera. Most directors would shoot this kind of scene with large close shots, playing the pathos of Alice’s pregnancy, but Stevens holds the wide shot for minutes, and doesn’t even show us Alice’s face as she gives George the news. 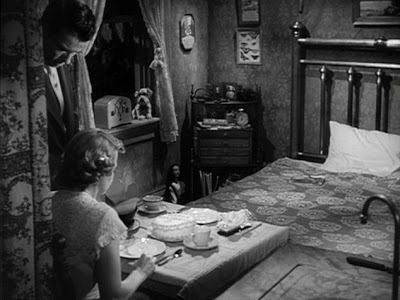 George crosses to her and the bed dominates the image. The room feels claustrophobic, like a prison cell. This tendency to visually de-emphasize Alice makes the audience feel as George does about her, that she is a burden and not worth caring about. George begins to contemplate Alice’s murder and he is lit in such a way that suggests the darkness of the thoughts that are occurring to him. As he begins to feel Alice’s threat to his new relationship, Angela also begins to fall into shadow. When Alice is finally presented to us in large close shots, similar in size to earlier ones of Angela, it is in the rowboat, just moments before she drowns. She looks distorted and the compensating close shot of George emphasizes his anxiety and revulsion. But the size of the shots also makes us suddenly aware of Alice’s humanity and the horror of what George is about to do. The restraint that has been shown before, in terms of image size, makes this scene all the more powerful in its presentation of the choice facing him. 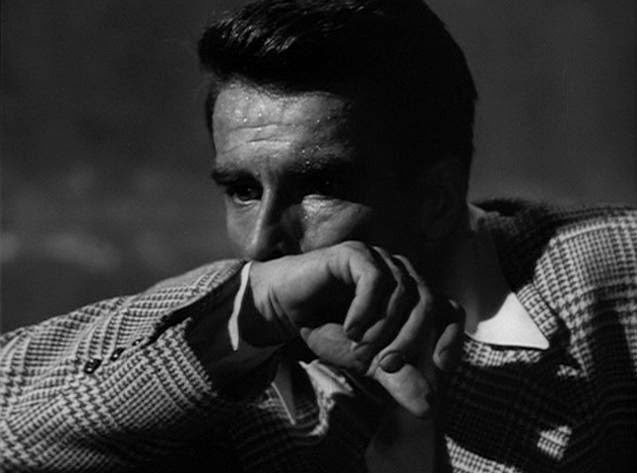 Finally, George is brought down by his abandonment of his moral sense, and he loses everything, convicted of murder and sentenced to the electric chair. 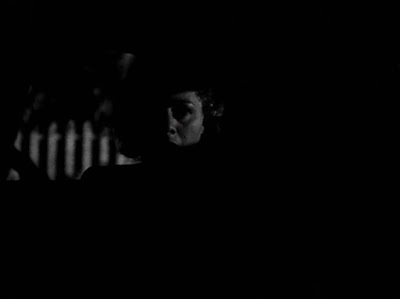 The film ends with George’s face in shadow, as he walks to his execution, a direct counterpoint to the film’s initial image of him, and then briefly the superimposition of Angela evaporates over his despairing face. In an interview with the AFI, Stevens said, “In A PLACE IN THE SUN I was interested in the mood and emotional effect of the story. I wanted to relate the audience to a character whose behavior it might not subscribe to. To bring that about, one must let the audience see his desire. They have to know his need for the thing that—even accidentally—traps him. So how do you do those things? …When I cut the film I became more and more conscious of the value of one scene against another, and how this spelled something out. I wanted to edit the film together in a way that meant more than the addition of one scene to another. I wanted a kind of energy to flow through. What really interested me was the relationship of images, from this one to that. Shelley Winters busting at the seams with sloppy melted ice cream in a brass bed, as against Elizabeth Taylor in a white gown with blue balloons floating from the sky. Automatically that’s an imbalance, and by imbalance you create drama. I’m interested in knowing—as visually as it can be stated—what’s on the boy’s mind.” One could make a list of the counterpoints throughout the film that demonstrate this flow of energy that he talks about—an orchestra playing at the huge party as George and Angela dance, but a scratchy radio playing in Alice Tripp’s small room; a motorboat with water skiers versus the rowboat; the prison contrasted with the empty, abandoned vacation home. Stevens is quoted in an interview with Robert Hughes, “I always had a strange feeling about that story, about the character of this young chap and the circumstances he became involved in, and that it wasn’t so much him on trial, as us—the society. I think that’s one of the reasons for audience involvement being very strong in the story.” It’s such an interesting idea to me, to set out to create a narrative that makes us sympathize with someone who could easily be dismissed, as a way of making us think about the values that we as a society hold important. Is a rich, beautiful girl more valuable than a poor, less beautiful one? Is wealth a barometer of happiness? Is thinking about something the same as doing it? Does ambition corrupt? 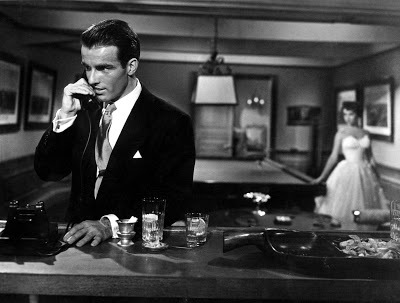 One of the most brilliant aspects of the film is the use of sound. Stevens said, “We used natural sounds for orchestration in the film, the conventional things of our world. When George is leaving the scene of his great misfortune, we hear a group of sirens in the distance far away. They are moving, and there’s a question of whether it is in his mind that he hears these things. Then we see that he hears them with an actuality, the feeling of impending doom that is gathering around him—the sirens and the dogs and the railroad…. I also had in mind certain tricks, for example the sound of the motorboat. There is an aura of mischief and violence about it. I took the motorboat engine sound out and put in one from a Nazi Spitzinbomber, the ones that used to dive on the people on the road when they were trying to get out of France. So the audience is somewhat misled, because when that motorboat pulls away, they are hearing a vicious sound that they might associate with other things…” The idea of using metaphoric sound is such an intrinsic part of the film-making process, but oftentimes is only thought about and examined in post-production. There is something to be said for striving to be aware and awake to the sounds that exist around us, in the moment, and to ask oneself when shooting, what are the sounds that are happening now that might provide aural texture for the content of this scene? What am I not noticing right now that might be worth accentuating to a dramatic effect? 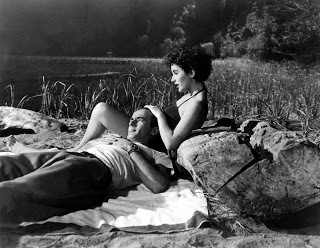 Finally, to wrap up my thoughts on A PLACE IN THE SUN: This is one of the first films I bring up when I’m teaching because of its beautiful, but simple and accessible, elucidation of its themes in a visual manner. It is also, on the tail of the second world war, a compassionate observance of the elusive nature of happiness and the enormous sadness that is an inescapable part of the human condition, regardless one’s social position. It examines our capitalist system, but without damning judgment or condescension. It reveals the shadow side of our aspirational dreams, but ultimately expresses compassion for the shadow.